Today, just seven decades after the publication of J R R Tolkien’s The Hobbit, hobbits are as convincingly a part of the English heritage as leprechauns are to the Irish, gnomes are to the Germans and trolls to the Scandinavians. Indeed, many people are now unaware that hobbits were invented by Tolkien, and assume that they have, more or less, always been with us. Almost everyone, whether or not they have read Tolkien’s books or seen Peter Jackson’s films, can form a picture in their mind of a hobbit’s characteristics. 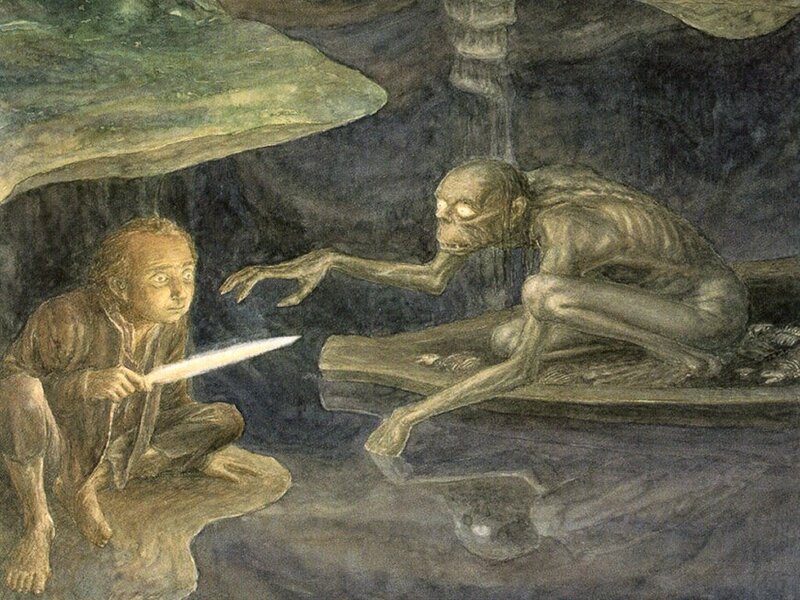 In Tolkien’s world they were a burrowing, hole-dwelling people, measuring between two and four feet in height. They were long-fingered, possessed of a well-fed and cheerful countenance, and had curly brown hair and peculiar, shoeless, over-sized feet. An unassuming, conservative people as described by Tolkien, the excesses of hobbits were limited to dressing in bright colours and consuming six substantial meals a day. Their one eccentricity was the art of smoking pipeweed, which they claimed as their contribution to the culture of the world. But where did Tolkien’s hobbits come from and were they solely his creation? The story of how Tolkien came up with the idea of The Hobbit is a familiar one. He describes himself laboriously marking examination papers in the 1930s when he turned over a page to find that a candidate ‘had mercifully left one of the pages with no writing on it (which is the best thing that can possibly happen to an examiner) and I wrote on it: “In a hole in the ground there lived a hobbit”. Names always generate a story in my mind. Eventually I thought I’d better find out what hobbits were like.’ It was, however, revealed years after Tolkien’s death that the word pre-dated his usage, though with a different meaning. It can be found, once, in a publication called The Denham Tracts, a series of writings on folklore dating from the 1840s. ‘Hobbits’ appear in Volume 2 in a list of supernatural creatures and are described simply as ‘a class of spirits’. Whilst it is of course possible that Tolkien read The Denham Tracts, this single-word appearance can hardly be called his source, let alone his inspiration, given that Tolkien’s hobbits are anything but ‘spirits’. They are in fact almost avowedly earthbound, as Tolkien wrote in his very earliest published account of them in the first pages of The Hobbit (‘There is little or no magic about them’). It was once suggested to Tolkien that, since the words sound rather similar, hobbits might have something to do with rabbits; a theory which was denied good-humouredly by Tolkien. It has to be said, however, that the opinion that hobbits are like rabbits seems pretty widespread in Middle Earth. In The Hobbit, the trolls who capture Bilbo in chapter 2 call him a ‘nassty little rabbit’. The eagle carrying Bilbo in chapter 7 tells him ‘ You need not be frightened like a rabbit, even if you look rather like one’. In the previous chapter Bilbo had himself started ‘to think of being torn up for supper like a rabbit’, and at the end of his stay at The Carrock, Beorn remarks ‘Little bunny is getting nice and fat again on bread and honey’. Thorin shakes him ‘like a rabbit’ in chapter 17. Whilst Tolkien himself was at pains to distance himself from it, the rabbit analogy is an interesting one. ‘Rabbit’ is a peculiar word because, unlike most other familiar English mammals like hares, weasels, otters, mice or badgers, there is no Old English or Old Norse word for it. The reason for this is that rabbits are immigrants, who only appeared in England in the 13th century as imported creatures bred for fur who escaped into the wild, like mink or coypu. Nowadays, of course, the rabbit (in the sense of both the word and the creature) is universally accepted as familiar, native and English. This, then, is their association with hobbits, who have similarly insinuated themselves, in their case into a Middle Earth full of older creatures like elves, dwarves and trolls, but also in a wider sense into English folklore. The fact is that hobbits are, and always remain, highly anachronistic in the ancient world of Middle Earth. We are told point blank by Tolkien that The Hobbit is set ‘long ago in the quiet of the world, when there was less noise and more green’. Yet Bilbo is identifiably English and not just that; he is staunchly middle class and roughly Victorian to Edwardian to boot. His home resembles that of a member of the Victorian upper-middle class of Tolkien’s 19th century childhood, being full of studies, parlours, cellars, pantries, wardrobes etc. Bilbo smokes a pipe, takes out his morning letters and has tea and all his other meals at the same set time each day. At first glance he and his ilk do not fit at all into the world of dwarves, elves, wizards, dragons, trolls, goblins, Beorn, Smaug and Gollum. However, it is by his very anachronism that Bilbo engages the universal problem faced and solved in a similar way by many writers of fantasy novels. In setting a story in some other world, an author may well find that the gap between that place and the reader’s modern awareness is too wide to be bridged easily and, accordingly, a figure essentially modern in attitudes and sentiment is imported into that fantasy world to guide the reader’s reactions. Bilbo then (together with his successor-hobbits from The Lord of the Rings) is a modern person who seems again and again to be out of place in the archaic and heroic world into which he is drawn, thereby serving a vital plot function. Concerning hobbits, however, conclusions are difficult to draw. They may be pure imagination on the part of Tolkien, a piece of English folklore long before he thought of them, a relation of rabbits, a plot device or some combination of all of the above. Much more information on hobbits, their origins and their adventures may be found in Professor Tom Shippey’s two excellent books The Road to Middle-Earth and J R R Tolkien: Author of the Century – as well as, of course, in Professor Tolkien’s own books The Hobbit and The Lord of the Rings. One final point that should be mentioned in this context is that in Appendix F of The Return of the King Tolkien himself states that ‘hobbit provides a word that might well be a worn-down form of holbytla [or ‘hole-dweller’, as Tolkien translates elsewhere], if that name had occurred in our own ancient language [i.e. Old English]’. Since Tolkien knew more about Old English etymology than almost anyone else who has ever lived, I’d suggest that this is as good an explanation for the origin of the word ‘hobbit’ as any other! ← King Arthur: Fact or Fantasy? It was wonderful to read about them, I love TLOR…I wish there was more though! 🙂 thank you! I agree with Roxi, I wish there were more. I could keep on reading the stories and be pretty happy. Thanks for the well researched post. I’ve always considered Hobbits not only a newly created version of other ancient creatures of lore, but primarily a plot device for Tolkien to highlight the evils of all the other characters in his grand storyverse. The Hobbits represent all that is pure and good in the world, so when even they are affected by the horror of the ring, you know the world is grave peril. I’m going to have to link this post to a couple of friends. They’re obsessed with the Lord of the Rings, and while that drives me insane, I suppose it occupies their time. 🙂 Good post, though. Thanks, hope they enjoy it! i’ve been meaning to mention how awesome I thought this post was. I read it over a week ago, and was enraptured by the subject matter and research you did. As a history major, I always love following things back to their origins. Very well laid out and thoughtful!